Without data, any online marketing effort is doomed to fail. As marketers, we don’t have the luxury of betting on feelings to perform for us, we need data. 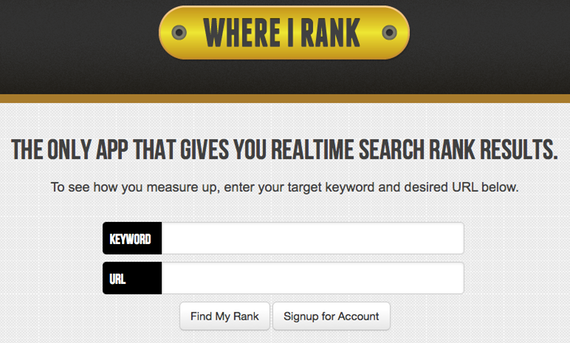 Now, you’ll be able to check your rankings objectively, in near real time. Introducing “Where I Rank”. (This software is now deprecated and no longer available. We leave this here for all the memories. Read to bottom of post for replacement). Performance Bonuses – When you rank a clients site to a certain position, you get a bonus. However, you’ll need a trusted and objective third party like Where I Rank. Personalized Results – Sometimes, it’s difficult for people to believe they actually rank in a certain spot when Google’s “Personalized Results” shows them on the first page and they actually rank page 5. Verify your existing rank tracking system’s ranking results – is it accurate? More Accurate Results – Because of our affiliation with industry leading partners Authority Labs we’re able to provide more accurate results by collecting the individual pages of search results in sets of 10 instead of one block of 100. This allows you to see more accurate rankings for your keywords. Full URLs not just Domain – Most tools only allow you to check the domain itself and not subdomains or full links to a blog post or internal page. That’s useful to determine where individual pages and posts rank for your keywords. Fast Results – Accuracy and speed is the name of the game. If a keyword you’re looking for isn’t immediately available, of which tens of thousands are, you can put in your email and get the result sent within a few minutes. You can also keep your browser window open and we’ll refresh the page when your results are ready! Google AND Bing Results – We have the ability to give you the results for Google and Bing with the same speed and accuracy so why wouldn’t we? WhereIrank has been phased out and is no longer available. For Keyword Rank Tracking look to AuthorityLabs (who provided whereirank data previously). A partner and co-founder at Vuurr, Chuck handles site architecture, UX, on-site SEO / CRO audits and project management. Chuck Reynolds is a partner and co-founder at Vuurr and handles technical web strategy, SEO and CRO and project management. In rare moments when he’s not establishing impressive websites with ironclad reputations, he’s mountain biking or hiking or shooting at paper people.